As my Top 10 Albums of the Year proved, “death metal in space” was a big thing in 2016. So let’s travel back in time to 1990 and the album that started it all: Nocturnus’ The Key and this excellent blast of sci-fi horror. Some sort of evil cyborg has invented a time machine and set a course for the date 0 B.C. He has only one goal: kill the baby Jesus! “Blasting away Father, Mother, and Child/laughing hysterically all of the while” the cyborg proves to be devastatingly successful in his mission. And Destroying the Manger proves devastatingly successful too: a wild shred-fest of riffs and solos that gets down to serious moshing business at 4:10. And check out the prominent keyboards too… Nocturnus going where no death metal band had gone before. New Releases – 23rd December 2016? Unsurprisingly, there’s hee haw bugger aw* out today and, even if there was something decent out, you wouldn’t want to be going shopping today would you? I know I wouldn’t. So I’ll take this opportunity to wish you all a Merry Christmas! Hope you have a great time and thanks for reading. To get you in the festive spirit, here’s the infernal dark lord of Wales: Shakin’ Stevens. With his folk horror-inspired, occult classic Merry Christmas Everyone. It’s fun to slay at the Y.M.C.A. Considering the huge impact Italy has had on the world of horror movies since the 60s, it’s hardly surprising that the first Italian Heavy Metal band was steeped in the sepulchral atmosphere of the graveyard. Death SS were formed in 1977 by guitarist Paul Chain (the “Death”) and vocalist Steve Sylvester (The “Vampire” whose initials also provided the “SS” of the band name). 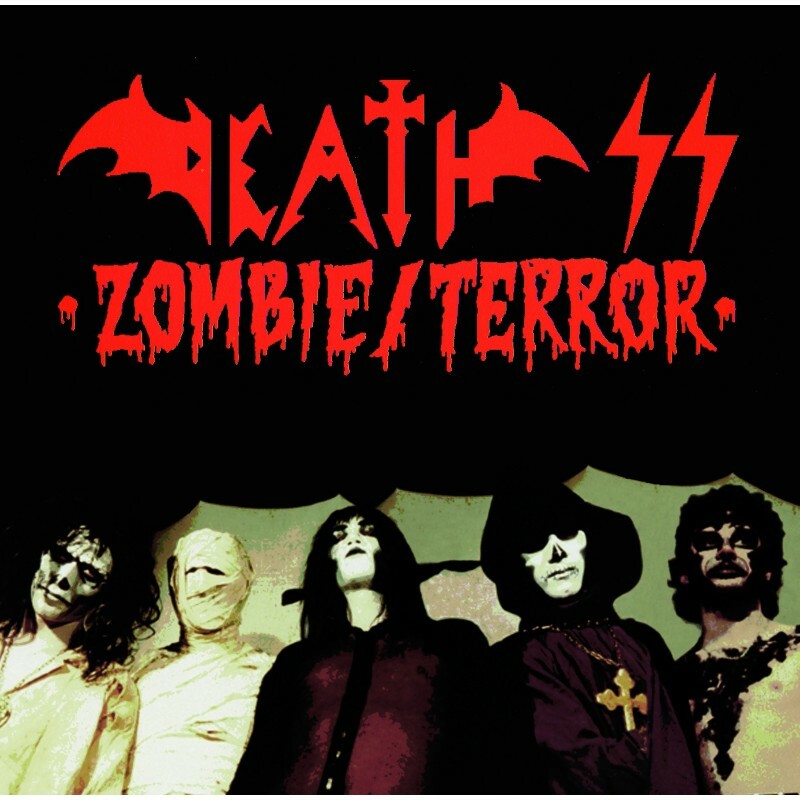 The band was rounded out by guitarist Claud Galley (The “Zombie”), bassist Danny Hughes (the “Mummy”) and the superbly-monikered Thomas Hand Chaste (the “Werewolf”) on drums. If the Village People ever went Hammer Horror they would probably end up looking something like Death SS. Although they toiled in obscurity, Death SS still managed to release demos and some privately pressed singles. The Zombie/Terror 7” is the earliest of those singles, an extremely rare release that has now been exhumed and reissued by Svart Records. A-Side Zombie is a 1979 demo version recorded at a rehearsal and B-Side Terror is a rough live take from 1980. Both are horrible, crudely performed and even more crudely recorded. But an inspired and creative magick cuts through the sonic fog. Naively simple but ominous riffs are topped with chiming, ethereally spooky guitar melodies and the vocal hooks in both songs are immediate and melodic enough to endure Sylvester’s cheese-grater vocals. The ugly rawness of the production and singing also strengthens the dark, occult atmosphere: a method that many Black Metal bands would make a virtue of years later. You could draw style connections via the Italians from Killer-era Alice Cooper through to the Black Metal genre but Death SS don’t really sound like anyone else. Their otherworldly eeriness, melodic nous and the murky, macabre shroud of sound makes for a darkly seductive listen that I’d strongly recommend to fans of occult/horror-themed Metal. Superior versions of both these songs can be found on the essential The Story of Death SS 1977 – 1984 compilation so newcomers should start there. But for existing fans this single is a great opportunity to own more of this obscure band’s rare and early work and to hear their first lumbering steps from beyond the grave.